Home › Posts with Tag "learn morse code"
Begin to learn Morse Code by starting out with the easiest and simplest letters in the alphabet. These Morse Code letters are the only letters in Morse Code that use one or two dits and dahs and do not combine the dits and dahs. From there, the next easiest step is to move onto the simple dit and dah combinations, those using only 2 or 3 dits and dahs. Finally, ending with the more difficult letters like “C”, “L”, “Q”, and “X”, that combine 4 dits and dahs in no particular “order”. Morse Code Tip #2: If at all possible, try to avoid visualization. That’s how a typical brain works when trying to learn Morse Code visually – trust me, I know. I learned Morse Code via memorization from an Encyclopedia, and it will forever affect the way I hear and interpret Morse Code. However, for people who are visual learners, learning visually may be the only way you learn. If that’s the case, print out or( hand write) a copy of the Morse Code alphabet with each letter written out alongside its roman alphabet counterpart. Then, grab a notebook and copy each letter multiple times each day. Even though many people think of Morse Code as a primarily audible language as it is most commonly used over the radio, don’t forget that it is also a visual language with its own written alphabet. Being able to visualize the letters as someone tries to learn Morse Code may be able to help speed up the learning process. Morse Code Tip #3: Listen to Morse Code as often as you can. Thanks to modern technology, you can find recordings of Morse Code just about anywhere – and you can find versions that are played back slower than what would be considered “normal” conversation. Take advantage of these options to listen to More Code and use these recordings and videos as tools to test your learning progress. This is especially important for learning the timing and spacing between letters and between words, as well as being able to instantly and effortlessly tell the difference between a dit and dah length of time. Morse Code Tip #4: Use Your Own Voice! Like most languages, Morse Code is both a written and auditory language. To prepare for listening to and translating dits and dahs, many people find it helpful to use their own voices to sound out letters and sentences as they practice. Another way of incorporating the learners voice is to translate a short story, children’s book, or paragraph while recording. This is a great way of creating a simple test that can be “graded” without any outside assistance later. Morse Code Tip #5: Have Fun! As with learning anything, the more personal, entertaining, and a part of everyday life the new skill becomes, the quicker it is learned and the better it “sticks”. This can easily be applied to Morse Code. Emails, texting, grocery lists, notes to loved ones, and journaling are all great options for incorporating Morse Code into everyday life for a little bit of fun practicing as well as getting others around you interested in a new hobby as well! This entry was posted in How to learn morse code, Morse Code Alphabet and tagged learn morse code, learning morse code, morse code, Morse Code Alphabet, morse code tips on 18 May 2012 by admin. Morse Code – From a SmartPhone App? W0w, I just came across http://buzzbuka.dsemeas.com/Buzzbuka.html which looks like its a pretty cool SmartPhone app for iPhone, Droid, or iPads. It looks like you can communicate in either Morse Code or with a different type of code that is not Morse. Using your volume key buttons for dashes and dots, you can pound out a message to your friend in Morse Code. But – that doesn’t solve the problem! You need to LEARN Morse code before you start using it in conversations with your friends. Still, this app might be a great way to hone your skills and give you motivation to learn Morse Code – because if you don’t know the Code, how will you send it to your friends? So, for $0.99 cents, why not? Give it a try. You’ll be sending and receiving Morse Code before you know it, and eventually may love it so much you decide to get your Ham Radio license! This entry was posted in Morse Code Applications and tagged code, learn morse code, morse code on 01 March 2011 by admin. Wow, I found this cool new way to learn Morse Code. I’m not sure what it’s called, and I wish it was around when I learned Morse Code, but it’s pretty awesome. I learned Morse Code out of an encyclopedia. It took me only about 2 hours of actual memorization. We used to pass noted in grade school written in Morse Code, and the coding/decoding also helped me to learn and retain it. If you memorize each letter individually, and then think back to it later, it’ll be somewhat easier to learn Morse Code. The only problem is timing – for instance, look at the Y. Y in Morse Code is “-.–” which is said, “dah-dit-dah-dah.” It’s tough to see in the picture above that the Morse Code Y should be that way, but at least you know that there are three lines and one dash, or three dah’s and one dit. 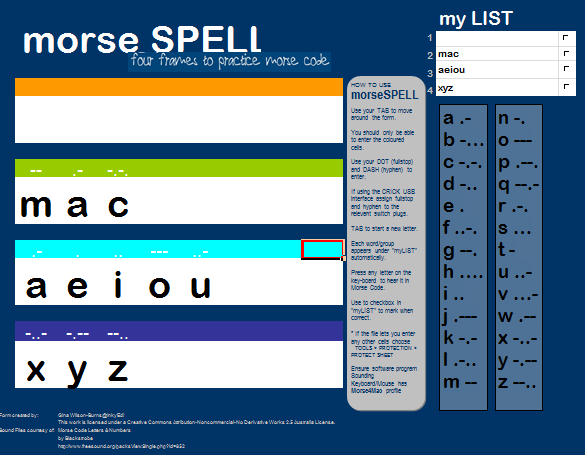 This entry was posted in How to learn morse code, Learning morse code, Morse Code Alphabet and tagged learn morse code on 08 December 2010 by admin. When I was about 11 or 12 years old, I would come home from school to my father pounding away on a straight or paddle key sending Morse Code back and forth to some person from an unknown destination. I always wanted to know how to send and receive Morse Code, but I was never able to understand. One day, I asked my father, “How do I learn Morse Code?” He sent me over the the Encyclopedia Britannica set that we have, and I studied Morse Code for days. I memorized the dots and dashes and was able to quickly learn Morse Code easily. I was able to write down the entire Morse Code alphabet, but learning to hear Morse Code was a totally different story. Learning Morse Code by ear was much harder than learning Morse Code by looking at it from an encyclopedia! The only problem was that I learned the wrong version of Morse Code, and I had to re-learn the entire thing! Today, it’s much easier to learn Morse code, especially since you can now learn Morse Code online! This entry was posted in Learning morse code and tagged how to learn morse code, learn morse code, learn morse code online, learning morse code, morse code on 15 April 2010 by admin.